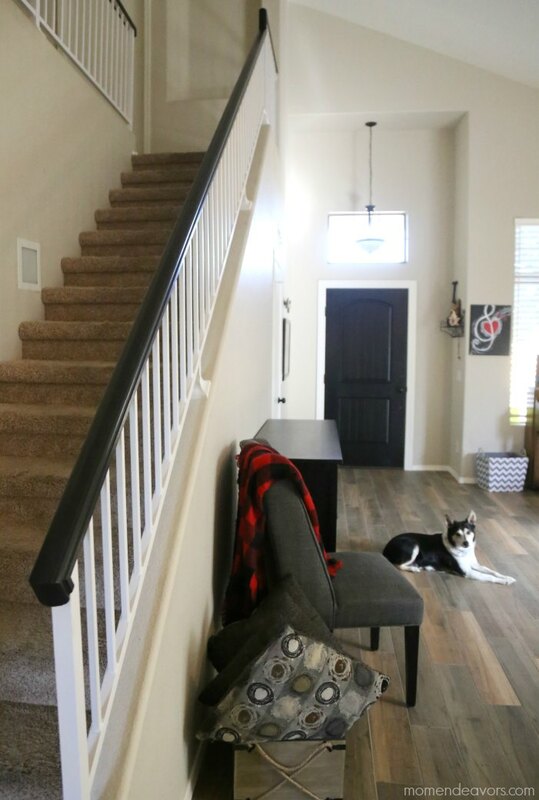 I’m so excited to share our DIY Stair Banister Makeover with you today, along with tips and information on painting your oak banister black thanks to a sponsored partnership with Lowe’s. If your house was built in the 90s or early 2000s, there is a very real likelihood that it is (or was) full of the orangey oak! Now, nothing against wood or oak, but, I just canNOT get behind the orangey hue combined with all the crazy wood grain! It’s just not for me, so in the last year we’ve been working to rid ourselves of the orange. The 1st project was painting the bathroom vanity black! (<– you can click there to see the before & after. It looks SOOOO much better!!!) 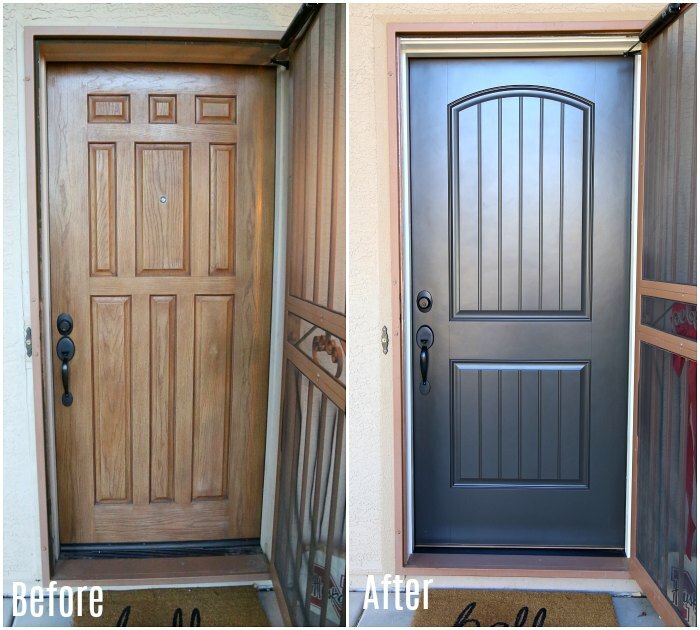 Then, we just recently upgraded our front door – getting rid of the oak look for a gray & black door that I’m IN love with! That wasn’t a DIY project, but we did get the door at Lowe’s and I LOVE it! 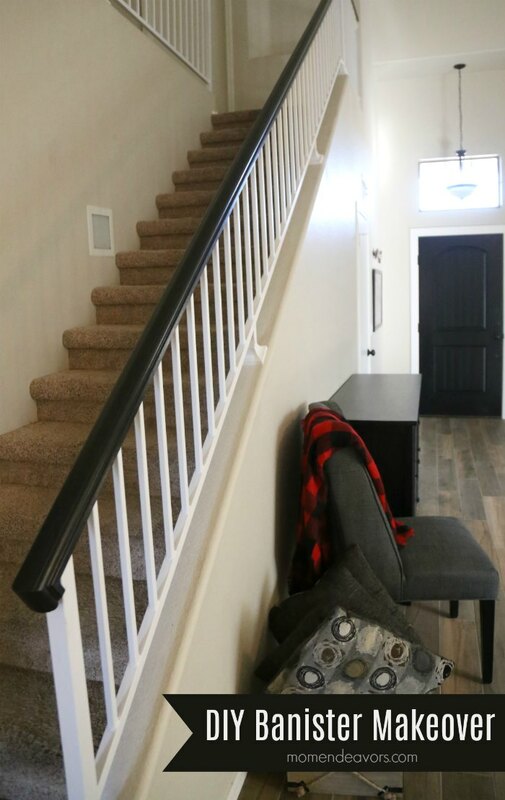 That completely changed the look of our living room/entry room, except for one glaring thing – the stair banister! With all the black, white, grays, and cooler wood look in our tile, the orange oak in the banister really stood out (not in a good way) in our front room! So we decided it was finally time to tackle this project. And, I’m SO glad we did! 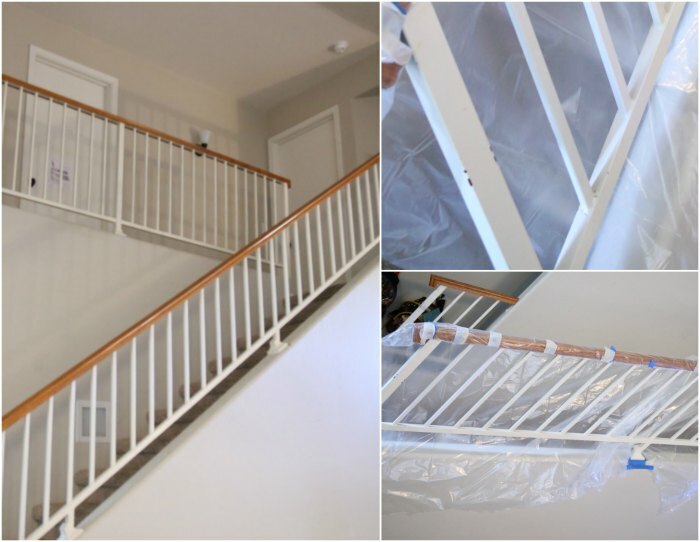 Th end result is SO worth it, but you will need a bit of time and patience to complete this project (especially if you need to paint the balusters). We decided we wanted to leave the balusters white. BUT…ours were actually more of a cream color. So, we wanted to paint those a brighter white. The catch though is that ours are metal! Gah! So, that limited our paint options and added to our time (& our process). 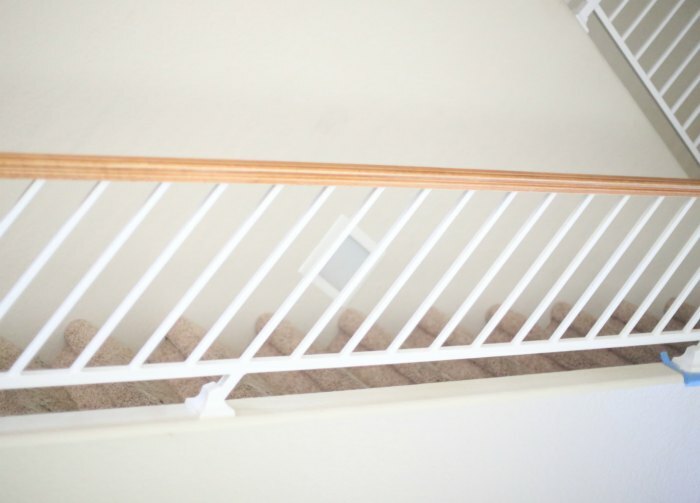 If you’re just painting the wood handrails, then that is a MUCH quicker process! 😉 The 1st step is to decide on paint! 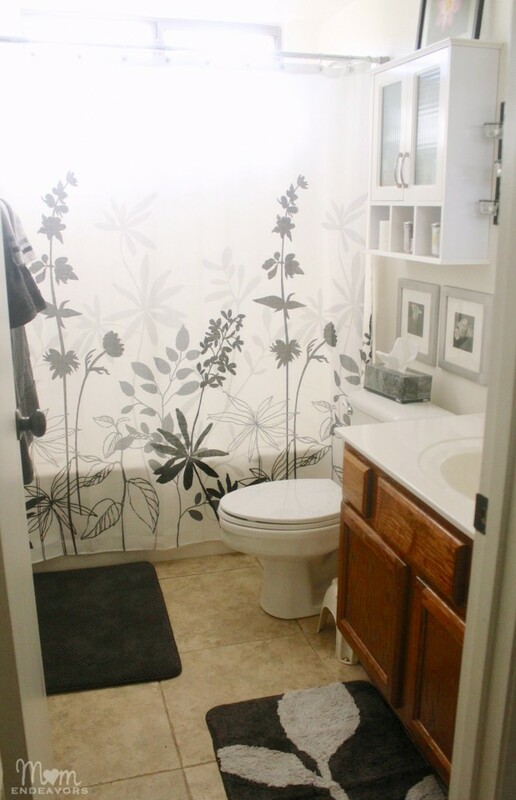 We used the same HGTV HOME by Sherwin-Williams Infinity Tintable Semi-Gloss Acrylic Interior Paint and Primer In One Paint (in “Black Magic”) that we used to paint the bathroom vanity. We are really happy with the results of that (still one year later), so figured we’d use the same thing for the wood handrails. Then, we opted for the Rustoleum spray paint. Spray painting was NOT our first choice, but it was either that or hand painting every baluster with oil-based paint. That sounded daunting (the paint specialists at Lowe’s agreed). So, we went the spray paint route. Make sure you can be in a well-ventilated space. With our nice weather here, we were able to open all our doors and windows to really help air out the space. This is a MUST! Wear a mask while spraying (you can buy masks & respirators at Lowe’s)! Cover everything with plastic or drop cloth! Spray painting leaves this dusty mist that can travel farther than you might think! So, really be mindful of taping/covering the floor, furniture, etc. Be sure to clean off the metal before painting. Spray LIGHTLY (you don’t want big globs and drips) and work as quickly as you can. 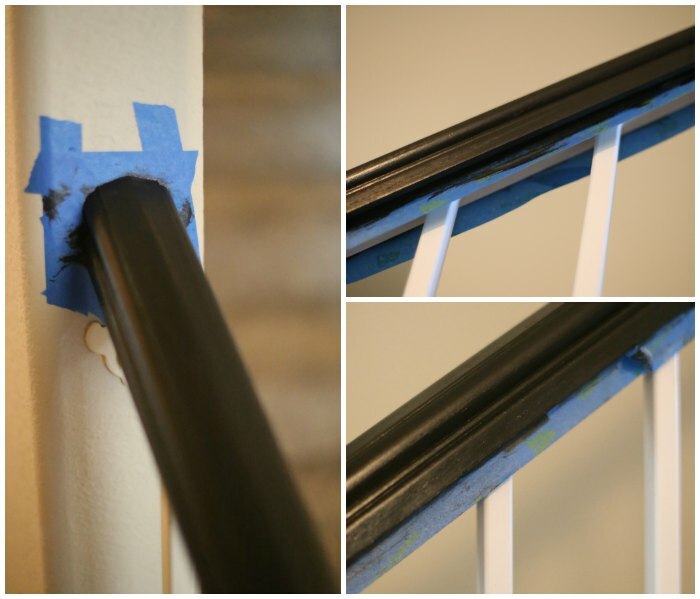 Spray paint the balusters first (covering the hand rail with plastic)! Then once those are FULLY dry on the entire stair case (we gave it over 24 hours just be safe), you can move on to painting & prepping the hand rail. Though it may not be noticeable in the photos, the new white paint was immediately noticeable to us! Once dry, we removed the plastic and started prepping the hand rails for painting! The first step in getting rid of the orange oak was sanding it down some. You want to get the varnish/stain off. REALLY give it a good go! If you don’t sand enough, you risk the paint not adhering well and your paint not holding up over time. So, really give it a good go (100-150 grit paper seemed to work well for us) to get rid of the shine! Then clean it off well – I recommend vacuuming it off then using something like a tack cloth. Once you’re done sanding & cleaning, get things taped off! For us, that included taping around the wall and the inside edge of the wood. I forgot to take taping photos until after was started, but you can see that it was definitely useful! 😉 Our rail is white underneath (where the metal attaches), so we had to tape the inside lip of that. 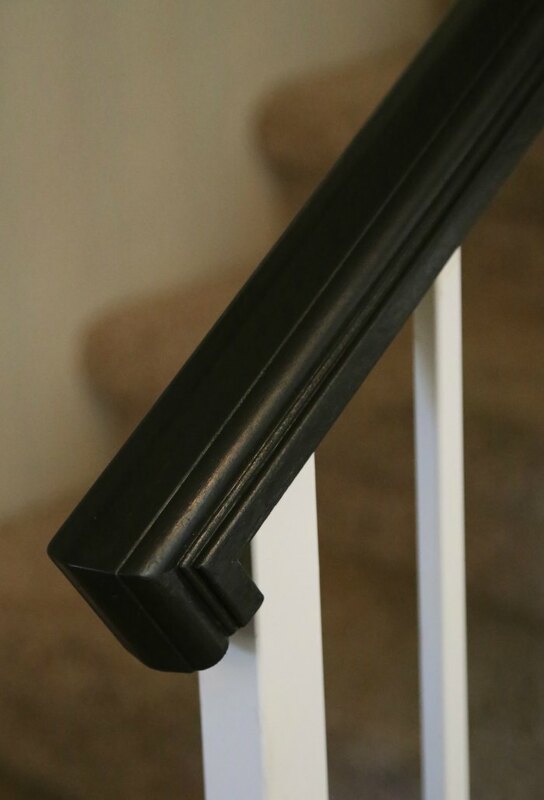 If your rail is solid wood, you’re going to want to tape around the top of each baluster. Once you’re done with prep (and do NOT skimp on the prep time or you’ll have more work later. Trust me on this! ), then you can start painting. Just like I did with the bathroom vanity painting, I did VERY thin coats of paint. VERY thin (just barely dip the brush in the paint). You don’t want globs, or drips, or anything like that! For this project, I used the cheap little foam brushes as they work SO well to get a thin, even coat and get in the grooves! That was the look after 2 coats! SOOOO much better. In person, you can see the wood grain still coming through, so we’re happy with the results. Eventually, we’d like to completely remodel the stairs. But that is a remodel that will cost thousands (and not a DIY project for us). So, this is a great, inexpensive fix in the meantime. We only spent about $100 on all of our supplies at Lowe’s. So, I’m very happy with the results – especially for the little money and bit of time spent! What do you think? Have you tried painting your banister? 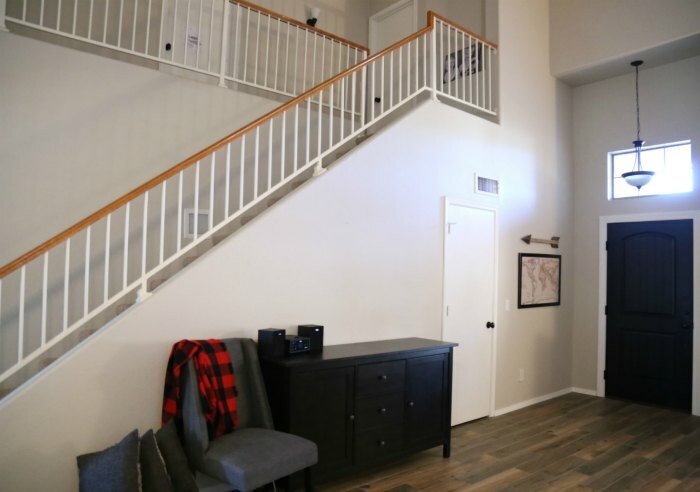 The updated door and banister really tie the space together. Love how it turned out!